If you’re a strong woman, you’re looking for someone to balance and match that strength. You’re looking for someone who can stand beside you and be your right-hand man, but also be your confidant, your safe space. You want someone who you can love and believe in, someone who won’t walk away at the first sign of trouble, but who will be there—truly be there if and when things get tough. You want a man who isn’t going to try to control you, but isn’t afraid of you, either. And because of your strength, because of your big heart, because of the way you’re both confident-minded and selfless, you often fall for men who will never love you with the same capacity and fearlessness. 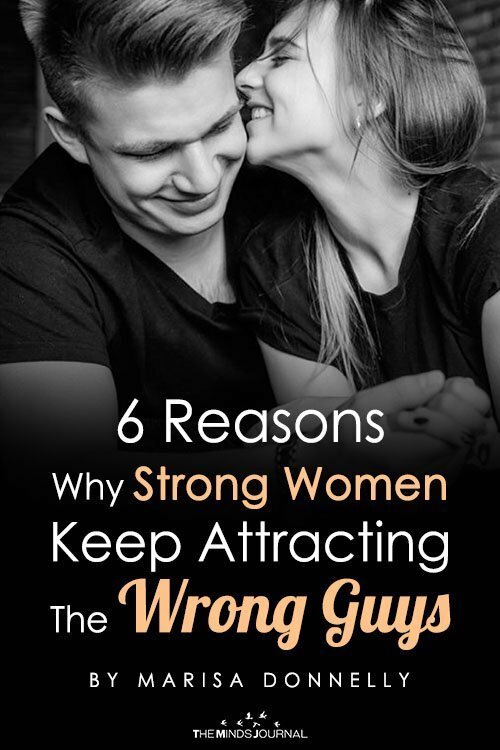 As a strong woman, you fall in love with, and keep attracting the wrong guys. 1. Because you’re inherently selfless. You’re strong and confident in who you are, thus you are able to love with a selflessness that many people can’t even comprehend. You’re a giver—love comes naturally to you—so you keep attracting the wrong guys because you’re so quick to care about people, regardless of whether or not they care about you that deeply in return. You’re not necessarily a bad judge of character, you just see the best in people and love them in spite of their flaws, but this often leads you to be taken advantage of. Your heart is driven to ‘fix,’ in terms of seeing someone who’s hurting or brokenhearted, and wanting to love them into healing. Rather than recognizing that it’s the guy’s job to work on himself, you intervene, trying to do the best you can when it’s not your problem or place. You fall for the wrong guys, thinking you can be the one to mend their brokenness. But it only ends up hurting you in the end. 3. Because sometimes you’re intimidating. You’re a strong woman, so sometimes you are unintentionally intimidating to men who walk into your life. It’s not that you’re aggressive or ‘too much,’ it’s simply that the wrong guys aren’t comfortable enough with themselves to accept a woman who is secure with who she is and what she believes. 4. Because you’re not used to someone matching your strength so you settle. You fall for the wrong guys because you’re too quick to settle. Because you’ve been let down before, you think that you have to grab whatever’s out there, rather than waiting for the right one. You’ve convinced yourself that there isn’t a perfect person for you. But you’re just believing lies based upon what’s failed in the past. There is someone out there for you; you just have to be patient. 5. Because sometimes you’re too independent. You’re a strong woman, so for a long time, you’ve relied solely on your own strength to get you through. For the wrong guys, this can make you appear ‘too independent’ for a relationship. The right man will know that this independence makes you who you are, and is something to praise not disapprove of. 6. Because you’ve learned to be your own savior. As a strong woman, you keep falling for the wrong guys because over time, you’ve foolishly believed that all you need is yourself. Although you are incredibly powerful and self-reliant, even the strongest people need a shoulder to cry on. For whatever reason, you’ve convinced yourself that you don’t need someone who is sweet, sensitive, and dedicated to you. But you do. You need someone who is going to understand both sides of you, and love your strength and your softness equally.